Welcome to our May edition of the Blogging Friends Blog Hop, where we are getting ready to say ‘goodbye’ to some of our favourites! This is a time of year that is both saddening and exciting; we’re saddened that some of our favourite stamp sets, colours, papers etc., are being retired, but at the same time, we’re all excited, looking forward to the new stamp sets, colours, tools, papers, etc. that we will soon have in our hands! So this month, we will each be sharing projects with our favourites that will be retiring – maybe you’ll see some of your favourites there, too. To tour through the blog hop, all you have to do is click on the ‘continue blog hop’ button at the bottom of each post – this will take you to the next participant. If some technical gremlins get in the way of a smooth hop (yes, it does happen! ), at the bottom of each post is also a list of each participant, with a link to their post that you can click on. So, enough with the ‘housekeeping’ – let’s get on with sharing! I think I have owned this set for at least 3 of my 4 1/2 years as a demonstrator, and I have used it for all types of cards. This time, I thought I would experiment with a new background technique, called Smackin’ Acetate. Basically, you cut open a Clear Envelope, or a page protector, so that it opens like a book. On the inside of the right hand side, apply your inks using either markers, reinkers or ink pads, and spritz with water. Close the top piece, and ‘smoosh’ the ink around with your fingers, then open it up, and insert your cardstock (I used Whisper White). You can repeat this as often as you want, until you’re satisfied with the colouring. I used Island Indigo, Cucumber Crush and Pear Pizzazz ink pads. 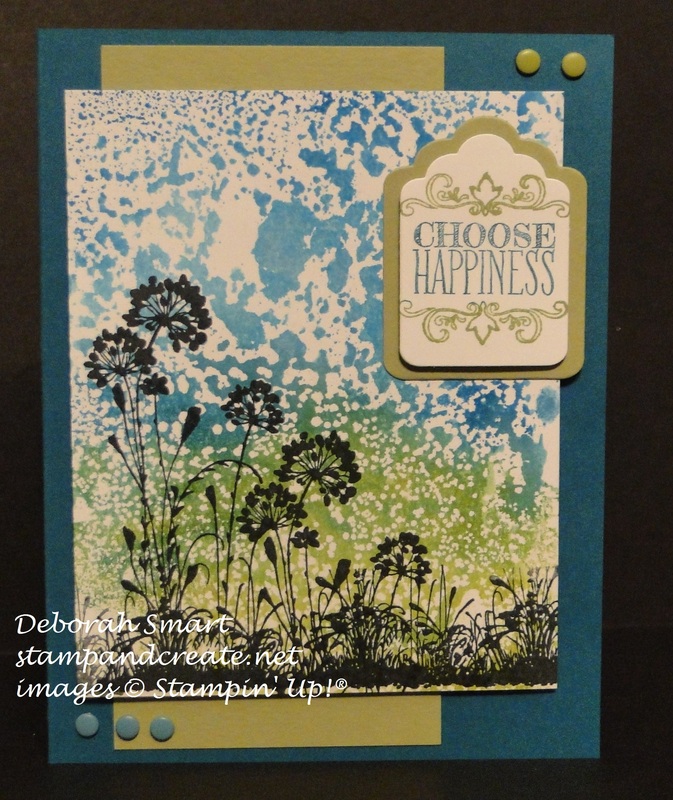 After the cardstock has dried, then stamp your image stamp – here I used the flower silhouettes from Serene Silhouettes. I stamped the sentiment from another retiring set, Choose Happiness, by inking up the stamp with my Pear Pizzazz and Island Indigo Markers. Then I die cut it and the Pear Pizzazz layer behind it, using the Tags & Labels Thinlits Dies. I used a card base of Island Indigo cardstock, and layered a 2 1/2″ x 5 1/4″ panel of Pear Pizzazz cardstock towards the left hand side. I then added the stamped panel using Stampin’ Dimensionals, and attached the sentiment. I added some of the retiring Candy Dots in the bottom left and top right corners of the card, to finish it off. For my focal image, I used the retiring Hostess stamp set called Best Thoughts. I just love this large bloom; it reminds me of a Rhododendron. I stamped the image in Memento Black ink onto Shimmer cardstock, then watercoloured it using the Perfect Plum and Old Olive inks, with an Aqua Painter. I really like using the Shimmer paper for watercolouring, as it doesn’t ‘pill up’ the way the Whisper White can, when it gets too wet. After colouring, I used the Tags & Labels Framelits Dies to cut out 3 layers inside the image. Then I glued down the largest piece to the Perfect Plum panel using Tombow liquid glue. For this technique, you want this layer to be flat. The next largest layer is attached using strips of double-sided adhesive. The next layer is attached using strips of double-sided adhesive, but putting 2 layers of the adhesive strips. The final, middle piece is attached by tripling the layers of adhesive strips. This is how you achieve the ‘telescoping’ outwards of the layers. Another way to use this technique is to reverse the layers – have the layers go from highest on the outside to lowest on the inside; I’m going to do one of those, next time! I then attached a strip of the retiring Blackberry Bliss stitched ribbon across the bottom of the panel. The whole front piece is then attached to a card base of Blackberry Bliss – a colour I am really, really going to miss! The sentiment is from the Butterfly Basics stamp set (not retiring – thank goodness! ), stamped in Perfect Plum ink onto Whisper White cardstock. Again, I used the Tags & Labels Framelits Dies to cut it and the layer behind it, and attached it to the card front using Stampin’ Dimensionals. So that’s it for my projects; I’d love to read any comments you’d like to leave! Then you’ll want to click on the ‘Continue’ button below, and hop on over to the blog of the talented Jessica Mink , and be wowed by her creations! I’m so glad you like my cards, Crystal! I love trying new techniques, and these were a lot of fun! Beautiful cards, Deborah! Thanks for sharing those techniques. I’m going to have to give them a try! Okay, I love both of these cards! The techniques are amazing. I had never heard of the Smackin’ Acetate techniques, and your telescoping technique is beautiful and perfect with the Rhododendron. So pretty! Aww, thanks Jodi! We have such a tough ‘job’, don’t we – playing with ink! 🙂 Thanks for your kind comment! Great cards, Deb. Thanks for sharing that watercoloring technique. Definitely going to give that a try! 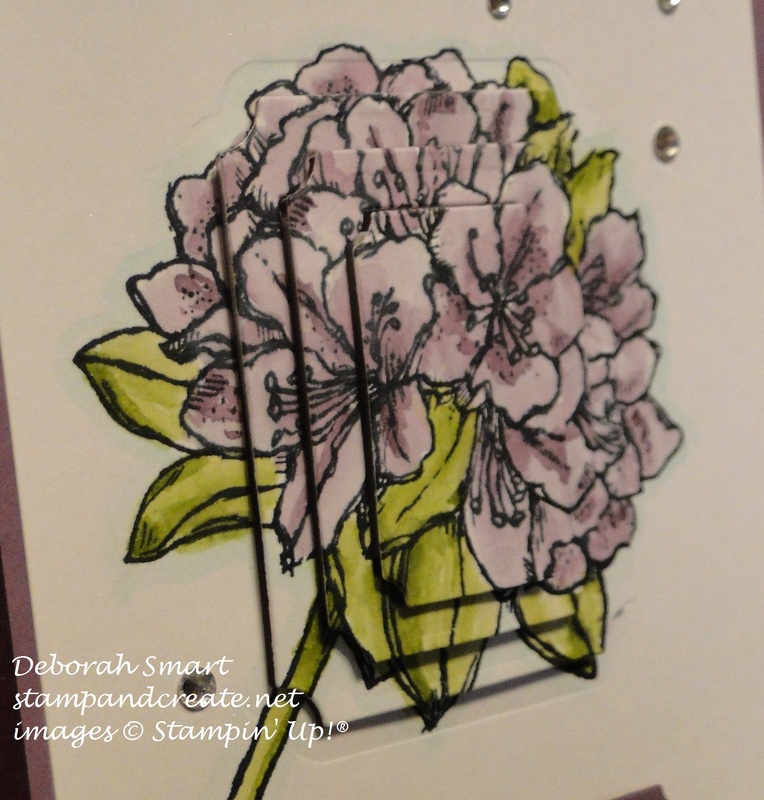 Great projects and a bonus with the ‘how to’s’ on your two cards! I absolutely love those techniques you shared. I have got to try that sheet protector one. I love how that turned out! Thanks Chris! I’m glad you enjoyed my cards for this hop. Looks like I have 2 more techniques to try out! 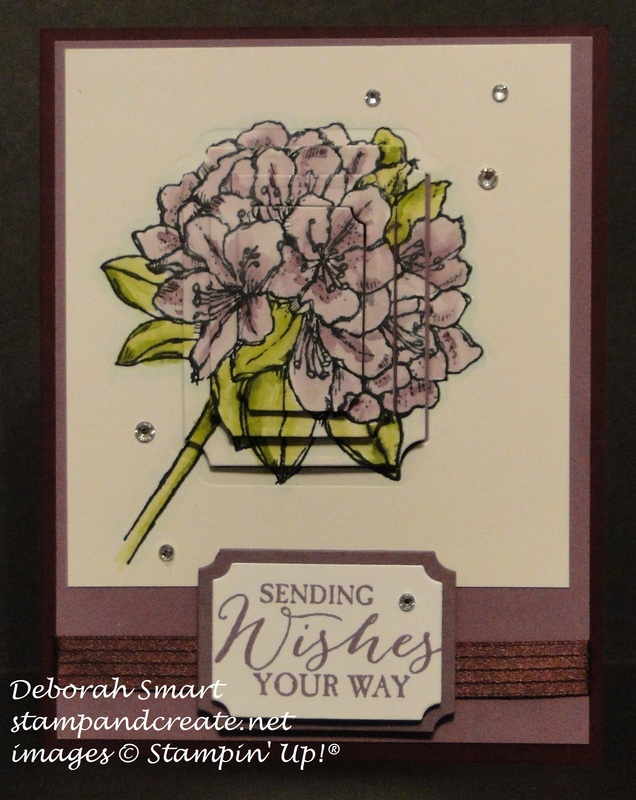 Beautiful cards Deb and thanks for your great step by step instructions! So helpful.